Sun-splashed fragrances inspire thoughts of a leisurely day in the kitchen, creating an incredible gourmet meal. 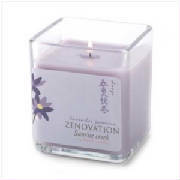 Lemongrass Lavender and Refreshing Grapefruit add sparkle to the air! 30 hours burn time. Weight 1.5 lbs. Paraffin wax; glass container. Each is 2 1/2" diameter x 4 1/2" high. Pair. Two classic fragrances come together, creating an incredibly soothing scent. Breathe deeply as the fresh florals of lavender and jasmine cast a calming spell over your spirit. 8 oz. jar. Made in USA. 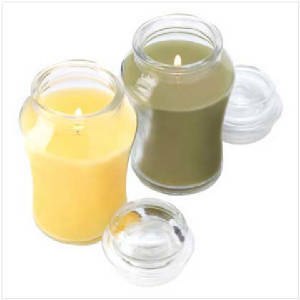 Soy blend wax with glass jar. 3" x 3" x 3 1/8" high. 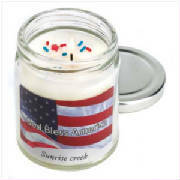 Colorful patriotic accents and breezy outdoor scent add all-American appeal to a soy based candle. This perfectly patriotic accent lights the night with the golden glow of freedom! 7.3 oz. Made in USA. Glass jar with metal lid. 2 3/4" diameter x 3 1/2" high.